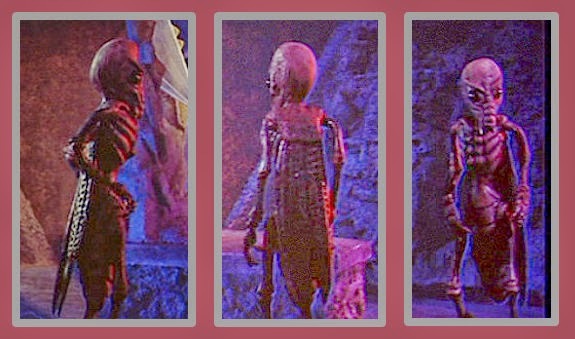 A Selenite Gallery: Profile, rear (with termite wings), and full frontal. 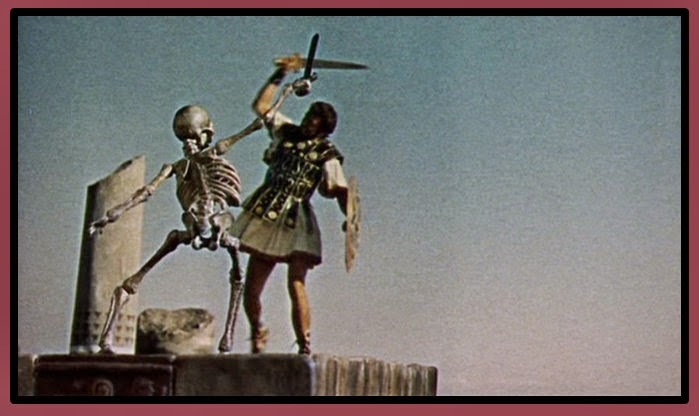 Both Ray Harryhausen and screenwriter Nigel Kneale were fans of the science fiction novels of H. G. Wells. 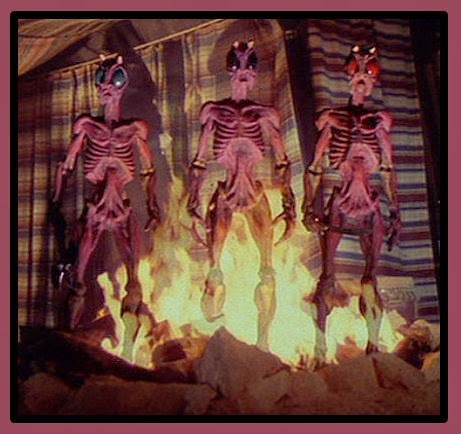 The concept of upright insectoids in The First Men in the Moon appears to have particularly appealed to them. Several years before First Men in the Moon, Kneale placed an eerie insectoid alien invasion at the center of the plot of his TV series classic Quatermass and the Pit, first broadcast in 1958. Near the end of his career, Harryhausen cribbed from his Selenite design to create a trio of insectoid ghouls, complete with little horns reminiscent of the demon insects of Quatermass and the Pit. 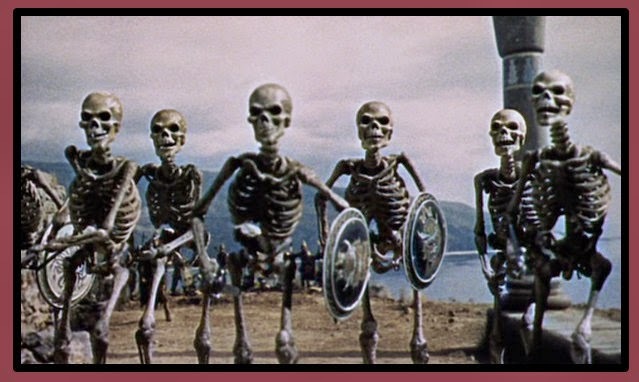 Designed for Sinbad and the Eye of the Tiger (1977), the ghouls are skeletal rather than segmented, but the faces possess a familiar creepy insect-like impassivity, like animated mantises. 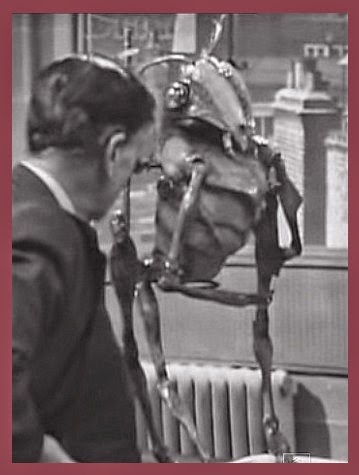 Intelligent alien insects remain a popular subject in science fiction, turning up everywhere from Star Trek to Starship Troopers. H. G. Wells basically invented the trope, as he also appears to have been the first to play with an alien hive concept, where intelligence is centralized in a highly ordered society. This probably relates in some way to the socialism that Wells later advocated, but as of 1901, it’s easier to see the lunar society as a satire of political ideas rather than either a utopia or a dystopia. The scientist Cavor is content to live in the moon’s great ant-hill but the prospect appears to have much less appeal to the other two humans along for the trip. Cavor (Lionel Jeffries) surrounded by Selenites in First Men in the Moon. Here’s Martha Hyer as Kate Callender receiving a full body scan from Lunar Homeland Security. Martha Hyer gets x-rayed in First Men in the Moon. 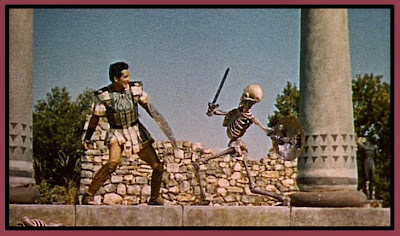 For this First Men in the Moon scene, Hyer’s body double was a warrior skeleton model left over from Jason and the Argonauts, pulled off the shelf by master animator Ray Harryhausen. The shot opens with Hyer fully exposed in naked skeleton mode, making demands to her interrogators as they study her bones. Then she leaves the scanner area and emerges screen left with her skin and clothes neatly in place. 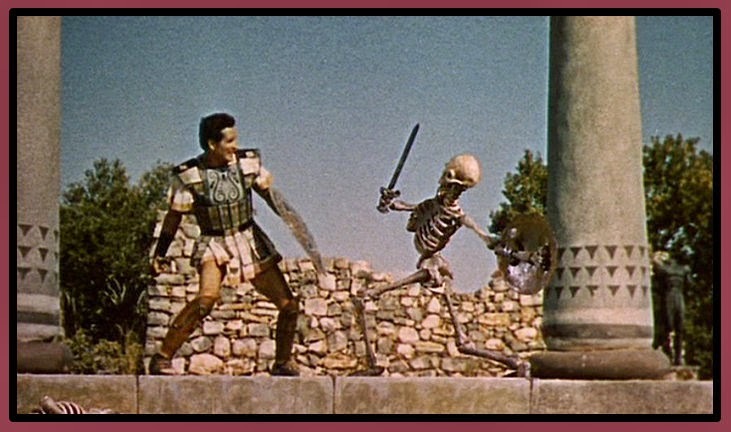 Whoever would have guessed that Martha Hyer had the frame of a Greek warrior? 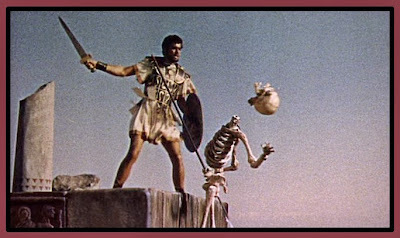 And… retroactively applying logic… wouldn’t this suggest that we can see Hyer—that ever-dependable chameleon of an actress—among the skeleton defenders of the Golden Fleece? Why, I’d recognize that skeleton anywhere! I think that's Hyer's skeletal frame second from left. Hyer gracefully parries a sword thrust. She's a little more graceful than the other skeletons, don't you think? Personally, I'm rooting for Hyer. This is how Greek tragedy inevitably ends. It just goes to show that we’re all the same under the skin. 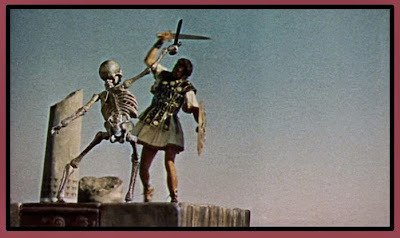 Great example of Ray Harryhausen recycling. And that video at the end was wonderful.